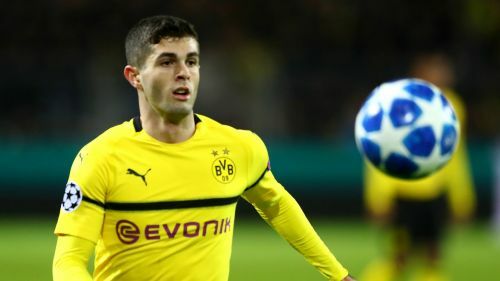 Borussia Dortmund have confirmed Christian Pulisic will move to Chelsea but the Bundesliga leaders will retain the United States international on loan until the end of the season. The 20-year-old, who can play on either wing or as a central attacker, is one of the most exciting young players in world football, with numerous records to his name already. Pulisic may have been usurped by Jadon Sancho at Dortmund, losing his place amid a contract saga that dragged on, but for €64million Chelsea have signed a forward with boundless potential. Omnisport assesses the Opta numbers to examine what Chelsea can expect from a talented young player who becomes the third most expensive signing in the history of the club. 115 - Pulisic will add to the 115 appearances he has racked up so far for Dortmund as he has pledged to stay and help the club in the Bundesliga title race. 15 - Those 115 games have delivered 15 goals, while Pulisic has also contributed a commendable 18 assists for the club to date. 5 - Pulisic has not been a regular for Dortmund this season, making only five Bundesliga starts after losing his place to Sancho. He has missed six games entirely in 2018-19, four more than in the whole 2016-17 campaign when he made 32 appearances. 13 - Since Pulisic made his Dortmund debut in January 2016, no other player for the club has recorded as many as Pulisic's 13 Bundesliga assists. Sancho already has 11, though. 20 - When Pulisic captained United States in a friendly defeat to Italy last November, Pulisic became the USMNT's youngest skipper at 20 years and 63 days old. 23 - Pulisic has started 51 Bundesliga games for Dortmund, but he has been substituted in 23 of those games. A further 30 matches have seen Pulisic come off the bench. 14 - Of Pulisic's 81 Bundesliga appearances, the American has only been on the losing side 14 times, winning 45 matches and drawing the remaining 22. 2 - When Pulisic scored his second Bundesliga goal at the age of 17, he became the youngest player ever to find the net twice in Germany's top division.